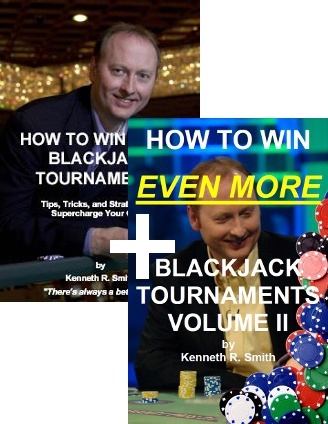 We are pleased to announce the publication of BJI contributing writer Kenneth R. Smith's latest e-book, How to Win Even More Blackjack Tournaments-Vol. 2. You can read about the book's content by reading Ken's article this month or by clicking here. Here's what Max Rubin and Kevin Blackwood had to say about Ken's new ebook. "Ken Smith is not only one of the world's best tournament players, he is also a great teacher of tournament strategy. I highly recommend his new e-book." Kevin Blackwood, author of "Playing Blackjack Like a Pro"
"This is the best Blackjack Tournament primer BY FAR! It's concise, easy to read and understand, and it will set the budding recreational blackjack tournament player far, far above the average competitor." Max Rubin, author of "Comp City" and host of the annual Blackjack Ball. BJI readers can purchase Ken's new ebook for only $14.95 Click here to order: www.bjinsider.com/HowToWin2. We begin the New Year with blackjack reports from casinos located in Las Vegas, Wendover, Atlantic City, and Greece (yes, Greece). Stu D. Hoss reviews the blackjack games at four casinos located on Flamingo Rd. in Vegas (Tuscany, Westin, Gold Coast, and Palms). KC Brooks visited three casinos on the Strip: Wynn, Encore, and Circus Circus. Basil Nestor visited Greece and reports on the blackjack games there as well as comparing casinos in Europe vs. U.S. Meanwhile, Frank Scoblete and his team of reporters provide an update on the blackjack games in the Atlantic City casinos. Toward the end of Ralph Stricker's brilliant playing career, he embarked on a new playing arrangement that he made with six wealthy players ... read what the arrangement was and how it played out over the 10 years that he used it. We've all read the stories and seen the movies about how the mob ran the Las Vegas casinos in the old days. Now you can read about the mob's influence on casino surveillance personnel during this time by reading Vinny DeCarlo's article. Frank Kneeland continues his discussion on why casino gamblers make bad choices when they gamble, while John Grochowski answers questions dealing with dice control, sloppy dealers, and the 1.1% rule in video poker. Last, but not least, we have the schedule of upcoming blackjack tournaments in different regions of the U.S. for January and February. AND... for our readers with Android mobile phones and tablets, we are pleased to announce that DeepNet Technologies (our publisher) now has their great blackjack basic strategy trainer, Blackjack Mentor available: http://www.deepnettech.com/buy_bjm_android, sold through the Google App Market. It has all the same professional training features you've come to expect in their iPhone, Windows and other mobile device versions. One last reminder: We made special arrangements with the publisher of the 2012 American Casino Guide book to offer it to BJI subscribers for only $11.75 (retail price is $18.95). The book contains over $1000 in casino coupons. Click here for the details and to order. This month's great "insider" article appeared in issue #35 of the BJI and it explains some common, but costly, blackjack player errors (every month we pick a great past article that is just as relevant now as then for our readers to enjoy once again!). E-mail subscribers can also read each month's issue online at our web site: BJI Issue #144, January 2012. And YOU can learn it too from his new e-book! 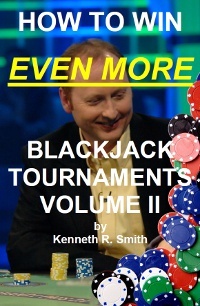 How to Win Even More Blackjack Tournaments - Volume II is 131 pages with a full cross-referenced index. Once you place your order in our secure store, you can immediately download the e-book to your computer where you can read it, save it, or print a copy (either using your printer or at a local print store such as Kinko's). The e-book is only available in Adobe Acrobat format from our BJI store, and can be read with the free PDF viewer software, available by clicking here. Ken's two e-books in one bundle! NEW from DeepNet Technologies, publishers of BJI! 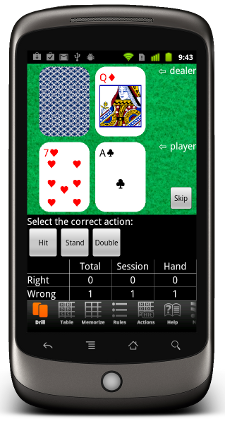 Now our popular and powerful blackjack basic strategy trainer is available for all Android devices. Includes new automatic action table selection from 144 built-in tables for different blackjack rules (including surrender and ENHC). Buy the best blackjack trainer, from the company that has specialized in advantage gambling training software for over 15 years. 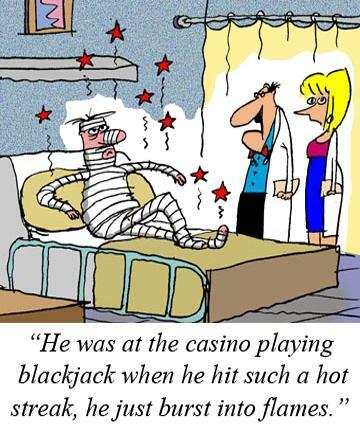 Play Blackjack with advanced casino options AND learn to count cards at the same time! "As we welcome a new year, I'm very proud to also welcome the release of my second ebook, How to Win EVEN MORE Blackjack Tournaments-Volume 2. It's been a long four years since the release of my initial work, so it's about time..."
"Lush landscaping and plants exploding in color surrounds the luxurious Wynn Las Vegas. With its man-made mountain, majestic waterfall, and flowers everywhere, the Wynn property oozes with luxury. One look and it is easy to see why this jewel shines above other resorts on the strip, a perfect marriage of nature and luxury..."
"Things begin to pick up with college football's Maaco Las Vegas Bowl prior to Christmas, and really get rousing as revelers from near and far celebrate the coming of the New Year ... Vegas style. Amidst the contrasts of December, I filled my saddlebags with cash and player's cards, hitched up the blackjack wagon, donned my spurs, and headed west down Flamingo Road to explore four off-Strip properties..."
"JPB visited several casinos in Wendover, NV to play their juicy single-deck game that, pay 3-2 for a blackjack. Read what happened to him and how he rates the game..."
"Bond, James Bond... The first time agent 007 spoke those words on screen, way back in 1962, he was gambling in a European casino. Playing in Europe conjures exotic images... London, Paris, Athens, Monte Carlo. It can be a lot of fun, but casinos in Europe are different in some ways compared to U.S. casinos. It pays to know the differences before you sit down and play..."
"In 1986, I decided it was time for a 'life change'. I was tired of the same old routine of blackjack team play and playing "hide-and- seek" with the casinos (to avoid detection). I was also getting tired of dealing with the different personalities of the players on my blackjack teams, especially listening to their complaining, etc. Playing and counting solo was not an option because I was afraid of being barred from too many casinos. I needed a change..."
"Read the latest news from Atlantic City, including a summary of playing conditions in each casino, and which ones have the best blackjack (and craps) games..."
"Read about the mob's influence on the employees that worked in casino surveillance in Las Vegas..."
"Grochowski answers reader's questions on how good does a dice control have to be to make money, taking advantage of a sloppy dealer that exposes her hole card, and the 1.1% rule in video poker returns..."